Popularly known as the Kiwis, they became one of the most influential and significant teams in rugby history. Their contribution to rugby lore was twofold: they resuscitated international rugby after World War II and they played a brand of rugby that set new standards of innovation and entertainment, in much the same way as the 1905 Original All Blacks had. But the Kiwis were not All Blacks. They were soldiers and they were selected after active service in North Africa and Italy and, in some cases, after lengthy spells in prisoner of war camps in Italy, Austria and Germany. Charlie Saxton, the 1938 New Zealand halfback and the only All Black among them, was chosen as captain. But such was the quality of their play, 15 of the team of 29 later played for the All Blacks. The Kiwis played 33 matches in Europe for 29 wins, two draws and two losses. They scored 605 points and conceded just 185. They beat the full international sides of England, Wales and France and lost just one international, to Scotland. 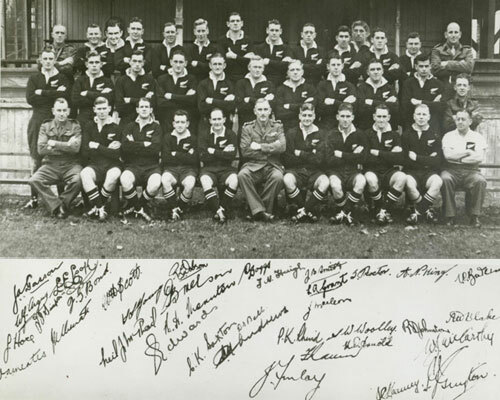 It was no coincidence that another rugby team regarded as one of the greatest sides, the 1967 All Blacks, were managed by Saxton and coached by another Kiwi, Fred Allen.